I got a MySpace friend request from this lot a few days ago. I hadn't heard of them before, but they seem well worth checking out if you like jazz guitar in the John Scofield and Kurt Rosenwinkel stylee. They're playing at Matt and Phreds this Thursday the 27th Oct, though I can't actually make it down myself. Some might say their vibe is a little derivative but it's well executed. The first MySpace track 'Mo Mo' is clearly going for that slurry sassy Sco groove and succeeds admirably. 'Interloper' starts off contemplative before kicking into a precise angular but still quite melodic line over a fast swing backing. 'Stormy Friday' sounds like classic introspective Sco again with maybe a nod to a Rosenwinkel chord voicing here and there. Looks like he plays the same Ibanez AS200 that Scofield uses to complete the references. See http://www.myspace.com/blakewilnergroup to hear the tracks and get more info. Having moved back to Manchester a few years ago now (I'm originally from Stockport), I couldn't help but be amused by references to 'leafy boho' Didsbury, as nice a place as it may be. A Cafe Rouge and Slug and Lettuce do not bohemia make. This for sure is not Hoxton or Prenzlauer Berg (no doubt London and Berlin scenesters will dispute the boho cred of these places too). Having said that, the opening of a fantastic new cafe, The Art of Tea, may nudge it a little more in that direction. As the cafe's MySpace says it "promises to put some much needed alt. back into the Didsbury scene!" - [everybody and everything now has a MySpace - apparently the cafe is male and 29 years old]. You can find this great new place at 47 Barlow Moor Road in Didsbury. The cafe offers "wholesome and hearty food, speciality drinks, wifi access, regular events, rotating art work, an awesome soundtrack and somewhere to pick up a classic novel". This all began as sad story. We headed down to Zero Records a few weeks ago to pick up a second hand CD and maybe a novel from the The Village Book Store at the back of the record shop only the find the place closed, seemingly another victim of bittorrent mp3 file sharing and Amazon. On returning from holiday in Lakeland we drove past to see the Zero Records sign back outside the shop and the new Art of Tea frontage. One of things myself and friends have been moaning about for ages is the lack of a decent cafe and here it now is! The next day we duly patronised the establishment and I can recommend not only excellent tea, but great coffee and a fine cream cheese and sun dried tomato bagel. Even the side salad garnish excelled with rocket leaves and a decent balsamic salad dressing instead of the usual pointless ice berg lettuce . The decor is a sort of alternative granny style with small knitted doilys on the tables and 1950's standard issue retro sofas. Not only this but The Art of Tea is hosting free Sunday afternoon 'Red Deer Tea Sessions' run by the The Red Deer Club. Local folk fave, Liz Green will playing there on Sunday the 7th of October at 3pm along with Aidan Smith & Sally Murray. Promises to be a good one, Liz being the winner of the Emerging Talent Competition at this years Glastonbury festival. Blimey! Realising I've missed a few things whilst I've been away. Just spotted on The Manchizzle that The Guardian did a blog roll feature on Manchester in August prominantly featuring this very blog (see Aug 25th on The Guardian Internet page). Cool! Def looking forward to the awards evening on 10th of October now! Anybody got an August 25th copy of The Guardian I can have? I have to confess that I've neglected this place a little in the last few weeks. Holiday time and all that. 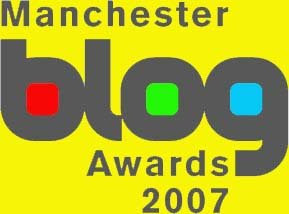 Anyways, I've just been dipping back into the blogosphere and spotted that I've been shortlisted for the Manchizzle Manchester blog awards that are part of the Manchester Literature Festival. A nice surprise! Well I've got quite a bit to write about so I better get on with it I guess. I went on a really good jazz summer school in Altrincham just before going on holiday so there's plenty to pass on from that. The blog awards ceremony is where we get to find who wins. It'll be at Matt and Phreds on Wednesday October 10th and it's free! Get your tickets from the festival website if you want to come along. I had to ring as the online booking form didn't work for me.